Held at Hotel El Embajador, Santo Domingo, the show was declared a huge success in highlighting the Caribbean Region’s best artisans. Officially opened four days earlier, on September 1, 2011, with a ribbon cutting ceremony by Dominican Republic’s First Lady, Dr. Margarita Cedeño de Fernández. Excitement and momentum continued over entire show. Providing much more than a selection of high quality handcrafted artisan products, Design Caribbean offered an environment of celebration and immersion in the Caribbean culture. This event hosted a small film festival of various Caribbean films including the Jamaican film, Ghett’A Life – winner of the Best Pitch Award at the Cannes Film Festival. Design Caribbean was privileged to have the attendance of the film’s lead actor, Christopher McFarlane, as well as the filmmaker Justine Henzell. Design Caribbean also featured a music concert, Many Rythms: One People, featuring a wonderful collection of artists from the region including Alison Hinds, Roldan, Xiomara Fortuna, Onika Best, Belo, Carrot Jarrett and L’Acadco. Not only did these musicians perform and keep the audience moving to their rhythms well into the early hours of the morning, but they also visited the children’s home, Casa Rosada, in Dominican Republic to entertain the younger audiences. As well, Design Caribbean sponsored a bus that enabled the children of Le Casa Rosada, an orphanage for children living with AIDS, to “Come and Celebrate the Beautiful,” with the musicians and Caribbean Export team at the Design Fair. Pamela Coke-Hamilton, Executive Director of the Caribbean Export, is thoroughly committed to the success of the Caribbean creative industries in the world marketplace. Throughout Design Caribbean, exhibitors were encouraged to attend business boot camps. These seminars ranged from talks on motivational Caribbean branding to explicit how-to details, such as how to compete online, presented by one of our sponsors, Global Directories, Caribbean’s Yellow Pages. The final day of the show concluded with the Design Awards ceremony. The Design Prize aims to highlight the best designs and design-oriented products at the show. It is a celebration of innovation, design and creativity as sponsored by the International Trade Centre (ITC) and Caribbean Export. Winners received a cash prize, a booth at the Design Caribbean 2012, and the marketing support to assist them to elevate and grow their businesses over the next year. A prominent panel of four judges selected the winners. Cindy Bowden, lead judge, is the President of the World Craft Council of North America, one of the 5 hemispheres represented in the World Craft Council. Jenny Polanco, Dominican fashion designer with over thirty years of professional experience in Dominican Republic, Puerto Rico, Bahamas, Paris and New York. Kenneth Montague, Toronto based art collector, and founder and director of Wedge Curatorial Projects and Milo D. Pickney of Yellow Lama. Tiyi By Design, is an exclusive Caribbean brand from Barbados, producing exquisite, hand crafted art jewelry. Modern Surinamese-designed jewelry hand crafted from silver. New Caribbean Design represents a group of artisans that work in collaboration, and weave together elements of craft production, community development and modern design. As part of the University of West Indies group, she displayed a Scarlet Ibis inspired ceramic jewelry collection. Encapsulating the spirit of design to “celebrate the ‘beautiful” our event took place in Santo Domingo, Dominican Republic from Sept. 1-4, 2011. 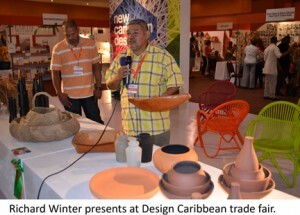 Showcasing a broad product range of handmade quality products, it connected artists to buyers, and design enthusiasts from the Caribbean region, North America and Europe.